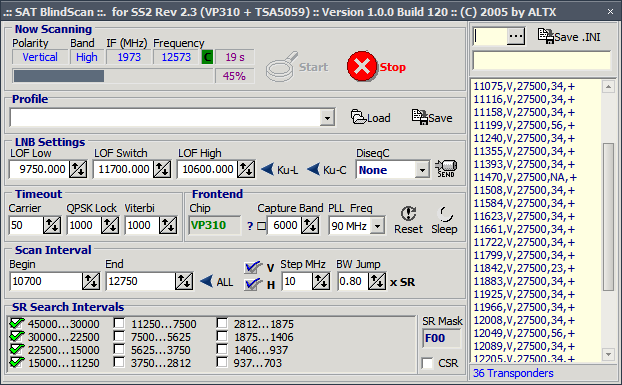 Blindscan is a program for SkyStar 2 card revision 2.3 that can sweep transponders, searching for any DVB-S signals. Because of tuner and demod chip used on this card, it's possible to autodetect PSK speeds without trying every single rate. This allows you to search entire satellite in 1-2 minutes. It injects DLL into original unmodified EXE to filter IOCTL requests send to card, correcting them to work on 4.5.0. There is included bat file (!run.bat) you must use run the program (or create shortcut that does same thing).